Chinese Hibiscus benefits in dealing with ailments like arterial hypertension, heart problems, diabetes, burning sensation during urination, menstrual disorders, cough, fever, and so on. It is used in traditional Chinese medicine, in particular. The herb helps control dandruff, seborrhea, and hair fall as well. Hence, it works as an effective tonic for hair and scalp. 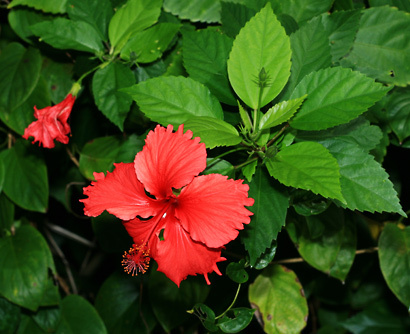 Moreover, Chinese Hibiscus is also cultivated as an ornamental plant. It is the national flower of Malaysia. Chinese Hibiscus is native to East India. It is grown in tropical and subtropical regions of the world. The flowers vary in colors such as white, red, orange, yellow, pink, peach, etc. This herb belongs to the Malvaceae family. Chinese Hibiscus has expectorant, antipyretic, antimicrobial, hypoglycemic, astringent, anti-inflammatory, emollient, laxative, refrigerant, emmenagogue, and aphrodisiac properties. It has a flavonoid known as cyanidin, which has antioxidant as well as anti-inflammatory qualities. It is valuable for patients suffering from type 2 diabetes and protects against liver damage and as well. Herbal tea prepared from Chinese Hibiscus works as a natural diuretic and is hence, useful for individuals suffering from kidney problems. Besides, the anti-fertility properties of this herb can be used for natural birth control. Here’s a video giving information on Hibiscus tea health benefits. The herb helps in increasing appetite, easing indigestion, and curing constipation. It relieves muscle spasms and menstrual cramps. Some other health benefits of Chinese Hibiscus are that it strengthens immunity, lowers fever, cures cough, and treats open sores, boils, swellings, mumps, etc. Furthermore, it promotes hair growth and reduces dandruff. Besides, intake of Hibiscus flower extract may help reduce the absorption of carbohydrates, thereby aiding in weight loss as it contains an enzyme inhibitor. 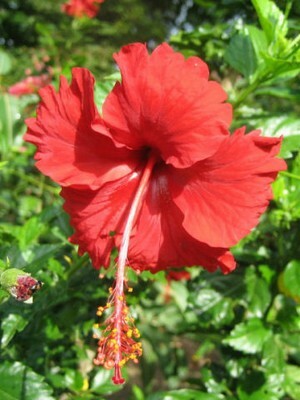 • Regularly having herbal tea prepared from the extract of hibiscus flower is valuable in lowering high blood pressure. • Prepare a solution by boiling two petals of Chinese Hibiscus in a cup of water and then straining the mixture. Add a teaspoon of honey in it and drink it on a daily basis. Follow this therapy for a few days to heal heart problems. Another natural cure for this ailment is to boil five hibiscus flowers in a cup of water until its quantity reduces to half. Then, mix a cup of cow’s milk and one teaspoon of sugar in it. Consume it daily. • Having hibiscus leaf juice mixed with water serves as a natural home remedy for leucorrhoea. • Decoction prepared from hibiscus roots helps heal venereal diseases and fever. Its buds, on the other hand, cure the problem of vaginal discharge. • This is herb is useful for regulating estrogen and progesterone balance. Thus, it can be used to treat menstrual problems like cramps. For instance, you can grind 10 hibiscus flowers, add the paste in a glass of milk and take it on an empty stomach during menstruation. • Chinese Hibiscus benefits in making your hair grow faster and combating hair fall. For this, you need to mix dried hibiscus in coconut oil and boil the solution. Allow it to cool and then strain it. Regularly massage the scalp with this oil. • One of the best Chinese Hibiscus home remedies for hair care is to soak one part of Hibiscus flowers and six parts of leaves in water overnight. Finally, squeeze the leaves and flowers to prepare infusion and rinse your hair with the solution. Those like to use henna in their hair can also add ground hibiscus petals (petals should be soaked in water for about five minutes before grinding) in the henna paste. • Boil a handful of hibiscus leaves in a glass of water. Cool and strain the liquid. Then, squeeze a lime in the solution and apply it on your head before shampooing your hair. This natural treatment helps reduce hair loss. • Control dandruff by applying a combination of half teaspoon each of essential oils of hibiscus, rosemary and clary sage in 10 teaspoons of jojoba oil. Finally, wash your hair with water after 15-20 minutes and use a mild shampoo. • Boil this herb in water and then crush it to form a paste. Apply it as a poultice to get rid of boils, swellings and even headaches. • To treat urinary disorders, soak 10 hibiscus flowers in one and a half liters of water overnight and drink this infusion frequently throughout the next day. Continue this therapy for two to three days. • Taking two teaspoons of dried hibiscus flower buds along with honey is valuable in relieving burning sensation during urination. You can also have this mixture with warm milk. Follow this procedure once or twice in a day. • Take the petals of one hibiscus flower and grind them. Mix this paste in a glass of buttermilk and drink it as a natural coolant for summers. 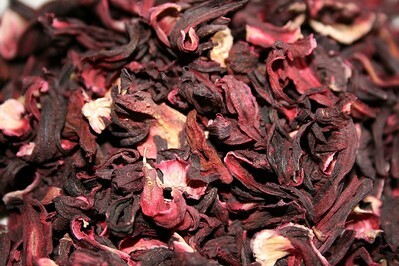 • Benefits of Chinese Hibiscus can be derived by having hibiscus tea. 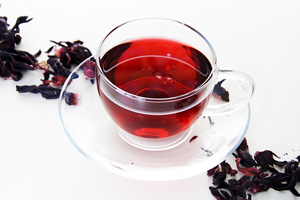 To prepare this herbal tea, steep a handful of hibiscus flowers in a cup of hot water for five minutes. Individuals suffering from kidney problems usually prefer to have this home medicine several times in a day without sweetening it. • Combination of hibiscus and rose hip tea helps reduce fever. • When dealing with sexual debility, take the stamens from five flowers and boil them in a cup of milk. Consume this natural remedy daily before going to bed. • Simply chewing a few hibiscus petals and then drinking water helps cure ulcers. • Eating Chinese Hibiscus flowers in the morning, on an empty stomach, purifies blood. Apart from these medicinal purposes, Chinese Hibiscus is used in various culinary preparations. At times, its leaves are used as a substitute for spinach. In India, the flower is crushed as used as a dye for blackening shoes. Although Chinese Hibiscus benefits in curing various diseases, excessive consumption of this herb can have fertility inhibiting effects. All in all, though, it does not have any strong side effects. Those who are allergic to plants of the mallow family may be susceptible to hibiscus allergy.